If predecessor “Scarab” was defined by a sprawling meditative aura, plodding and claustrophobic, “Kala” witnesses a chameleon shift towards the menacing. The upfront guitars of “Quartered” buzz and scratch like insects waking in the hive. By “Quartz” they are on the move and wings beat rapidly in pursuit of pollen in their colourful environs. Hues of deep reds, oranges and yellows shimmer in the sun as they crawl over delicate petals. Throbbing anticipation builds on the cusp of having their fill. Chimes jangle softly in the breeze as the twanging strings of “Ox” slow the pace right down. But oscillating between hazy calm and crushing dirge the danger never really disperses. 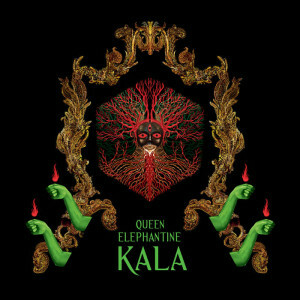 Unmistakably Queen Elephantine, the attitude throughout is decidedly darker. In fact, it borders on defiant. “Onyx” accelerates, pulsing and droning, it’s percussively exact with multiple sets of hands and sticks beating out the rhythm. Vocal accompaniment, here and elsewhere, remains sparse yet lends ample weight to the layered ceremony. The final offering at the “Throne of the Void…” Is the longest by far and more in keeping with the expansive slow building rites of recent albums. But when that calm cracks around five minutes in, it’s torn asunder, with the very force and furore that permeates so much of this record. Strange as it may seem, “Kala” also carries the illusion of being remarkably brief by the collective’s standards with “Deep Blue” in particular gone in the blink of an eye. But that sense of brevity and the inherent weighty texture may just carve a niche into some stony hearts as firm favourite in their canon.